My gosh, there are dozens. There is a series numbered 1 - 18 printed back to back (e.g. 1 & 2, 3 & 4, 4 & 5, etc.) and there are the left-overs from various years' workshops, which are unnumbered. Plus there are prayer flags, fortune telling fish, and other little oddities... It's a big ol' grab-bag. I loved the fortune telling fish that came with my last order! It's not in the catalogue,right?Cause it would make a nice tiny present. number of LM flyers made? i swear ive seen this asked before but i cant find it anywhere. i was wondering how many different flyers that LM makes? like the ones that describe how to use things like sachet powders, using oils, and etc. as id like to request ones i do not currently have. id rather not call the shop and use up time that could be used for those that need the help more then i. Re: number of LM flyers made? The flyers are distributed at the Hoodoo Heritage Festival and are noted as such on the Festival pages. Thank you very much for finding this !! The Fish was the neatest little "thing" Ive ever seen. I took it out of my box of herbs that was ordered and received, put it to work in my palm and wow it was right on in it's "activities"!!! Check out the goodies included in your order. You never know what you are going to receive in these gifts y'all!!! Enjoy your orders. They are packed with love and prayer. They are wonderful and full of surprises!!! -- and it will be sent to you! I will revise this message when the item is added to our Complete Inventory, Books, and shopping cart sites. That is so cool! I've had a lot of fun slowly collecting them all as I order stuff, but I think I'm going to have to "cheat" and order them all Thank you for taking the time to do this! Is it ok to ask for a flyer to be included in my order when I buy at the store? It seems like I'm shopping at the store at least as often as I order online. I'm going to get the series too. I always get the same ones with my order and I've always been curios on what was on the other ones. Snake, you can probably ask them next time you're there. If it's only given with online purchases then they would probably just tell you so. that fish fortune telling thing was cool i like the goodies keep them coming! Paper Nepalese prayer flags go into the orders too. For those who shop in the store, we have a wooden literature rack from which customers can select one flyer per order. There is a second literature rack in the shipping department, where alternative flyers are kept, because we have many types to choose from and not all may be available "out front" at any given time. I would just like to say that I have seen the folder/booklets of the hand-outs and they are very nice and attractive...well worth it! Like so many before me, thank you for the extra goodies you include with our orders; it's like digging through a box of cracker jack to find which prize was included! Many thanks for all the hard work you do. I'm sorry but I don't see one. You can request any flyer we have in-shop by adding a note to your order. If you missed doing that, call the shop at 707-887-1521 and ask that someone locate your order package and add the flyer in question. We do not keep all flyers in print at all times. Right now we are distributing flyers from the 2015 and 2016 Hoodoo Heritage Festival. http://hoodooheritagefestival.com has a list of flyers, but you have to look year-by-year. Gratitude points to anyone who runs through those pages and collects the data and posts it here. As soon as we have enough flyer pages to make another book, we will publish them in a matching volume to The Black Folder. We anticipate doing so in 2019, at the rate we are publishing them. TAKE-HOME: A two-page handout on How to Make Sachet Powders. TAKE-HOME: A two-page flyer describing the folkloric collections and interviews made by Harry M. Hyatt from the 1930s to the 1970s. All LMCCo hand-outs and Hoodoo Heritage flyers from 1996 through 2013 were compiled in THE BLACK FOLDER. This started as a clack three-hole-punch school-type folder you cou7ld buy from the shop with all the flyers to sate at that time. As the number of pages increased, the cost of the folder went up. Eventually there were enough pages and enough of a demand to lead to the printing of an actual BOOK that bore3 the title "The Black Folder. This is a full 136-page book that contains all of the hand-ous and flyers up through 2013. Starting in 2014, a new collection of shop hand-outs and flyers was assembled. This series was not released in a three-hole-punch folder, but only as loose sheets. 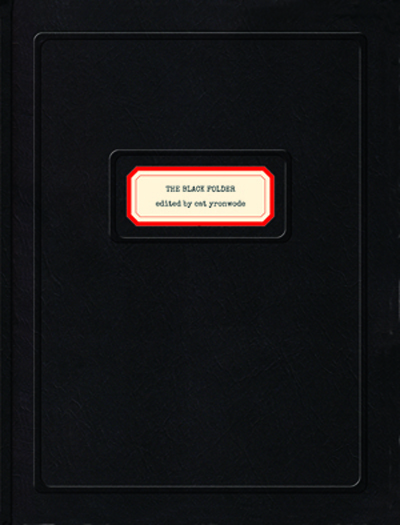 Based on the success of THE BLACK FOLDER, it was intended from the beginning to be released as a book, and was given the title THE RED FOLDER. This book was timed for release on the occasion of the last Hoodoo Heritage Festival to be hosted by cat yronwode, in May 2019, as a wrap-up to the second series of shop hand-outs and Festival flyers. Starting in the summer of 2019, the shop will return to the production of loose flyers, for the help of customers who are new to hoodoo, and these will be marked as reprints from either THE BLACK FOLDER or THE RED FOLDER, to encourage sales of the books. If you own both books and do not wish to receive flyers that are reduntant to the two books, please write "NO FLYERS, PLEASE" in the message area of your order. This will save us considerable money in printing and mailing flyers. First, we can only return to the production of new Hoodoo Heritage Festival flyers if someone else takes on the job of hosting the annual Hoodoo Heritage Festival. Second, we may produce brand new new shop flyers; we may make single-sheet flyers as off-prints from LMCCo , Southern Spirits, Mystic Tea Room, and other of our web pages; and we may also continue to create flyers based on extracts from new books we publish (as has been done in both THE BLACK FOLDER and THE RED FOLDER). It is thus likely that a new book (tentatively titled THE GREEN FOLDER) will be collected for release sometime around 2025. However, unless there are new Festival flyers, much of the content of THE GREEN FOLDER will be showcased reprint material, and will be marketed as such.